Prominent & Leading Manufacturer from Mumbai, we offer dirty utility sink with bed pan rack, dirty utility sink, hospital dirty utility sink, ss dirty utility sink with bed pan rack and ss dirty utility sink. 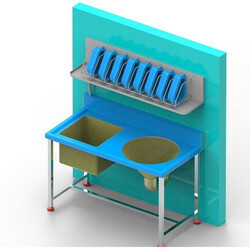 The Dirty Utility Sink with Bed Pan Rack is designed for drying specimen bottles and bed pans rack. Manufactured from 1.6mm commercial grade 304 stainless steel sheets and. Ideally suited to aged care facilities and health projects - often in conjunction with the Dirty Utility Sink with Bed Pan Rack in hospital dirty area. Hot cool water mixer taps available. High-quality stainless-steel sink unit featuring a very large 1200 as per length x 550 depth x 910 mm height & bowl size 500L x 400W x 300H mm with slop Hooper This unit is supplied on a stainless steel frame which can be fitted drained connection 38 DIA. The Bedpan and Bottle rack is a Stainless Steel Rack designed to fit bedpans and urine bottles. 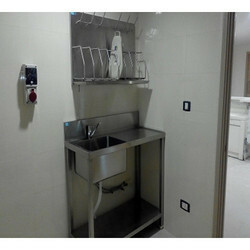 Can Be wall mounted bedpan and bottle rack size: - 1200 L x 335D x 300 H mm. The Dirty Utility Sink is designed for drying specimen bottles and bed pans rack. Manufactured from 1.6mm commercial grade 304 stainless steel sheets and Ideally suited to aged care facilities and health projects - often in conjunction with the Dirty Utility Sink and Hot water-cool water Dirty Utility (sluice) in hospital dirty area. 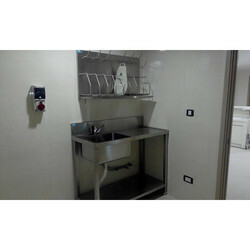 The Hospital Dirty Utility Sink is designed for drying specimen bottles and bed pans. Manufactured from 1.2mm commercial grade 304 stainless steel sheets and 10mm stainless steel rod, provisions are provided for storing a number of bed pans and bottles and can be made to various capacities as specific projects necessitate. Ideally suited to aged care facilities and health projects - often in conjunction with the Hospital Dirty Utility Sink and Hot water-cool water Dirty Utility (sluice) and Bed Pan rooms. The SS Dirty Utility Sink with Bed Pan Rack is designed for drying specimen bottles and bed pans rack. Manufactured from 1.6mm commercial grade 304 stainless steel sheets and. Ideally suited to aged care facilities and health projects - often in conjunction with the CMPMETAL Dirty Utility Sink and Hot water-cool Water Dirty Utility (sluice Room ) in hospital dirty area.hot cool water mixer taps available. High quality stainless steel sink unit featuring a very large 1200 as per length x 625 depth x 800 mm height & bowl size 500L x 400Wx 300H mm with slop Hooper This unit is supplied on a stainless steel frame which can be fitted drained connection 38 DIA. The Bedpan and Bottle rack is a Stainless Steel Rack designed to fit bedpans and urine bottles. 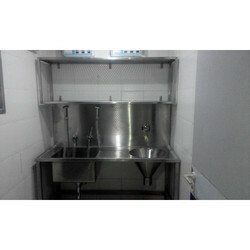 Can Be wall mounted bedpan and bottle rack size: - 1000 L X 335D X 570H mm. 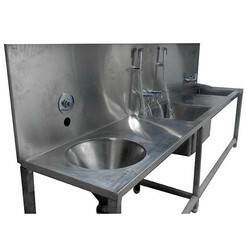 SS Dirty Utility Sink is designed for drying specimen bottles and bed pans rack. Manufactured from 1.6mm commercial grade 304 stainless steel sheets and. Ideally suited to aged care facilities and health projects - often in conjunction with the SS Dirty Utility Sink and Hot water-cool Water Dirty Utility (sluice) in hospital dirty area.